Special Christmas Card - Misc. 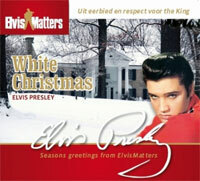 Our friends from ElvisMatters will send out a very special Christmas card once again. It's a deluxe 2008 CD with an original Elvis song - "White Christmas" - in a stunning folf-open cover. This strictly limited release is not for sale anywhere, and can be obtained through this club only. So, here's another reason to join them!